Wouldn’t it be fantastic to create your own wonderfully realistic railway scenery that’s at least as good as many of the model train layouts you view at model train shows? Well, if they can do it, so can you. In this downloadable Model Railroading Scenery Construction Techniques book, Brian Miller shows you how. He explains everything step-by-step in a way that even the newest beginner in the hobby can easily understand… but don’t take my word for it, watch the video and see for yourself. Model train layouts can take up a lot of space, so N scale (N gauge) can be a sensible option if you still want room for plenty of amazing scenery and interesting train operations. Getting Started in N Scale Model Railroading book by Tony Neilson is a perfect resource for the N scale railroader as works through problems and solutions. It also includes many valuable tips and interesting ideas that anyone in the hobby would find useful. Here you’ll get dozens of track plans for N scale layouts which can easily be adapted for larger scale layouts. The track plans range from 3ft x 2ft plans, through to 4ft x 2ft, right through to larger train layouts to fill a complete room. Tony Neilson also includes an excellent range of shelf layouts in this Space Saving N Scale Track Plans e-book, along with pages of useful tips and ideas for planning and building a trouble-free layout. Learn about using Arduino micro controllers to add interest and efficiency to your model railroad layout. 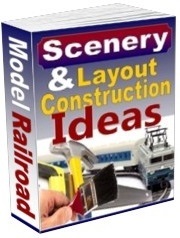 This revealing Scenery & Layout Construction Ideas ebook is packed with photos and clever techniques to make constructing your layout easy and fun. There are numerous tips, tricks, answers to problems and clever methods demonstrated. You’ll see photos and scenery techniques from real layouts… and see how to easily adapt and use them yourself… to create a railroad to the quality of the model train layouts you’ll often see on display in train exhibitions. Click on the book cover for full details. This also comes with 303 Model Railroading Answers to questions on DCC conversion, detailing techniques, train maintenance, scratch building construction, technical topics and much more. These are real answers to real questions submitted by readers.